Atlas and the Anchor: Scraper - "Scraper" 7"
The San Francisco street-punk trio, Scraper recently released their self-titled debut EP as a limited edition 7” and digital download on the new Drag City Records imprint, God?. The EP was recorded by psych-pop prodigy Ty Segall and Eric Bauer and is the follow up to their limited cassette release on Wizard Mountain. Scraper’s appropriately abrasive yet groove-laden and grimy skate-punk sound pays homage to the classic punk of the late 70’s with an old school New York punk aesthetic that defies expectations of a band from San Francisco. The anthemic charge of the opening track, “Liquid Lips” with its sloppy riffs is the perfect introduction to their gritty, lo-fi punk ethos and frontman Billy Schmidt’s husky and hoarse voice, which recalls that of James Johnson from defunct Baltimore art-punk band, Wilderness. The outstanding first single, “Alien Eyes” follows with an infectiously catchy, chanting chorus and a rhythm that chugs along, trying to shake off the sludge. Another standout, “Electric Hairpiece” highlights the band’s off-kilter sense of humor with surreal lines like, “your girlfriend is a cabbage” and “drip your face to plaster”; all set to thrashing guitars and crashing cymbals. Their psychedelic-leaning lyrics and noise-addled sound is probably what attracted Ty Segall to the band in the first place. Next, “Plastic Head” flirts a little with revved-up rockabilly and features some crazed background vocals, while “Third Wheel” is built upon a fuzzy bass guitar-led rumbling rhythm that is bombarded with unhinged guitar freak-outs and paranoia-laced lyrics. The six-song EP closes out with “Time”, which opens with a slower pace made up of churning guitars and fractured melodies, before launching into an energetic outro; sounding like a mix of post-punk and 90’s slacker rock for a nice change of pace. 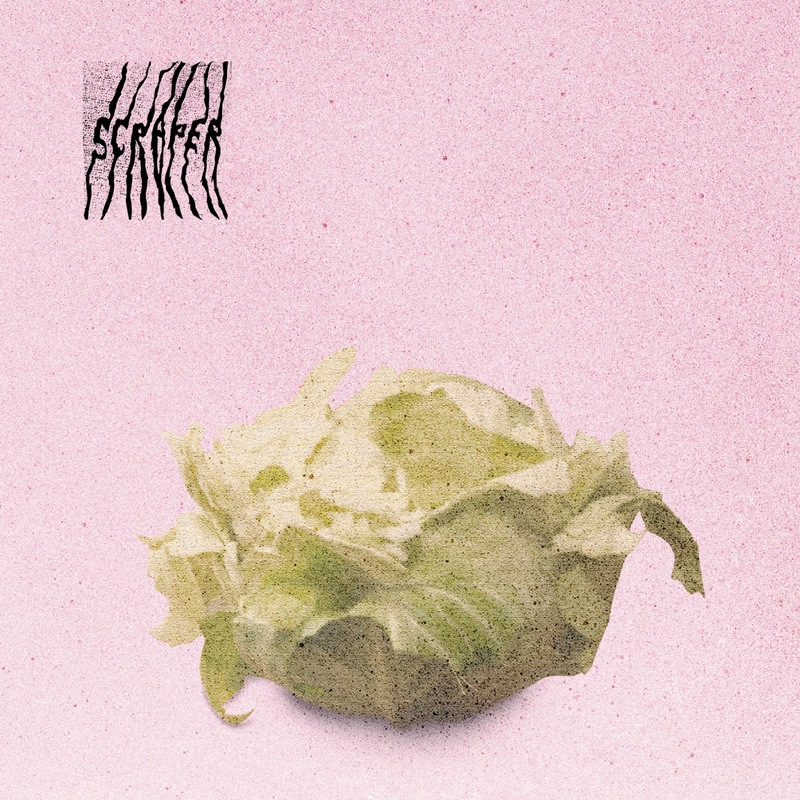 Scraper’s debut EP is very promising and offers a glimpse into the weird greatness we can expect from a proper full-length release from the trio.